Often times, when you notice a potential problem or issue in your bricks or masonry, it can give you a sense of fear and panic. You may think to yourself, “How did this happen and how will it ever get repaired?” You may feel like your situation is so unique and rare that it is beyond repair. Anglin’s has been working with foundations, mason work and bricks since 1930. Our experts have seen just about any problem you may have encountered at your home or commercial property. There are many common brick and masonry problems you may have, and here are some of them. Oversaturation of a ground area and brick wall may cause bulging bricks or masonry. Your shelf angle is probably corroding and you probably have excessive rain flowing down the side of your home due to insufficient gutter or downspout placement. Cracking in your steps leading into your home or business may occur. This happens when settlement of your foundation occurs. Brick compaction causes your bricks to compact and results in settling or sinking under the weight of your home or building. Vertical cracks occur when drying and shrinking happen around your home or commercial property. Leaning or tilting chimneys are dangerous and they require repair and a solid footing in order to function safely and properly. 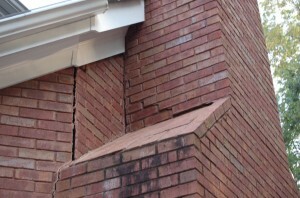 If you notice an issue with your foundation, brick or mason work, contact one of our experienced professionals to come out and take a look at it right away. It may be a cosmetic problem, but it also may potentially be a sign of a much larger problem. We will come out and diagnose your problem, and offer you the best plan for repair and restoration of your property.